1888-1904 autograph album that belonged to Harvey Elliott Mayberry, "Elliott", of Dugspur, Virginia. 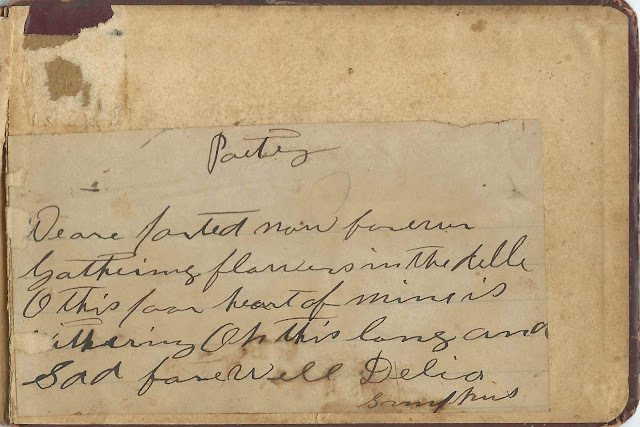 Several inscribers wrote Elliott's surname as Maberry, and one who called herself Elliott's cousin wrote her name as Ella Mabry, which appears to have been spelling that Elliott's father used. Elliott's gravestone, however, is etched Mayberry. Elliott inscribed the dedication page. 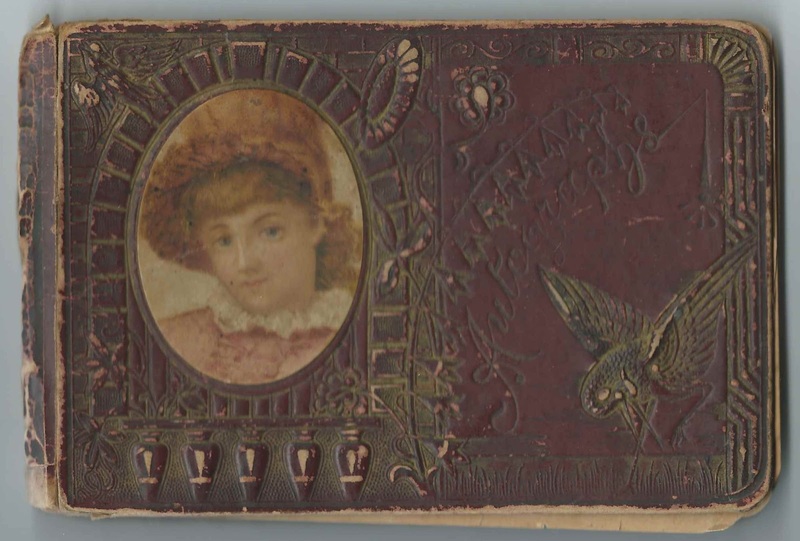 Two of the pages include gem-sized photographs, one of them presumably inscribed by Elliott's first wife Susan (Simpkins) Mabry in 1890, with photographs of herself and Elliott. Susan died in 1904. The album measures approximately 6" by 4" and is partially disbound. 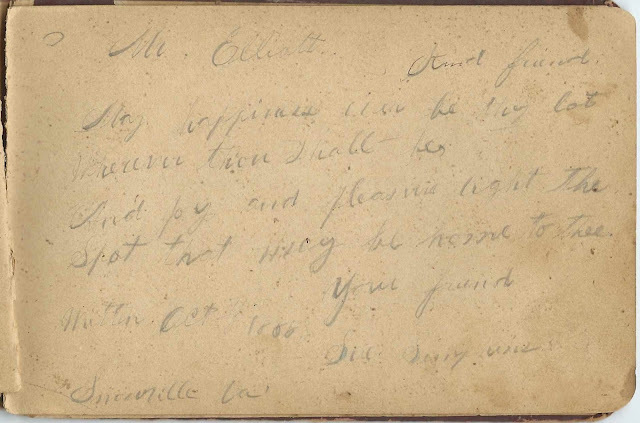 It contains the sentiments of 25 of Elliott's relatives and friends, three photographs and a newspaper clipping of the poem "Love Song of the Future". An alphabetical list of the inscribers, together with any personal information they offered, appears at the end of this post. According to information on his gravestone, Harvey Elliott Mayberry was born 3 September 1866 and died December 3, 1953 (indexed as December 4 on the Find a Grave memorial). His parents were Greenberry Mabry and Mary Louisa (Sutphin) Mabry. Eliott married Sue Simpkins, daughter of Calvin Simpkins and Elizabeth (Wilson, I think) on March 4, 1889 in Pulaski County, Virginia. Sue inscribed a page in the album before their marriage, with her residence given as Snowville, Virginia, and, as noted above, may have been the inscriber of the page with the two photographs, shown just above. Before Sue (Simpkins) Mayberry died in 1904, she and Elliott had at least two children, son Oscar who died in infancy in 1892 and son Fred, born in 1894. Inscriber Delia Simpkins seemed to be referring to a death, perhaps that of Sue (Simpkins) Mayberry. On December 4, 1904, Elliott married Emma Florence Yearout, daughter of Jacob Yearout and Nancy (Lawrence) Yearout. Emma was born, according to her gravestone, on August 27, 1879. A Virginia Births and Christenings record shows August 10, 1880; although it's indexed as a birth, perhaps it was the date of her christening. Elliott and Emma had at least three children, daughters Bettie, Ethel and Ora. Harvey Elliott Mayberry and his wives Sue (Simpkins) Mayberry and Emma Florence (Yearout) Mayberry are buried in the Simpkinstown Cemetery at Simpkinstown, Virginia. 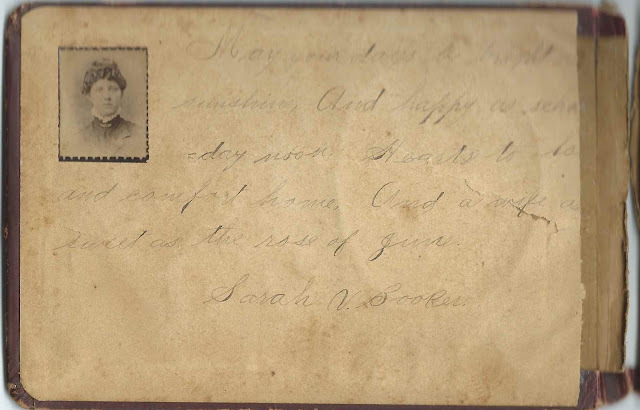 The other person who affixed a photograph to her page was Sarah V. Booker. 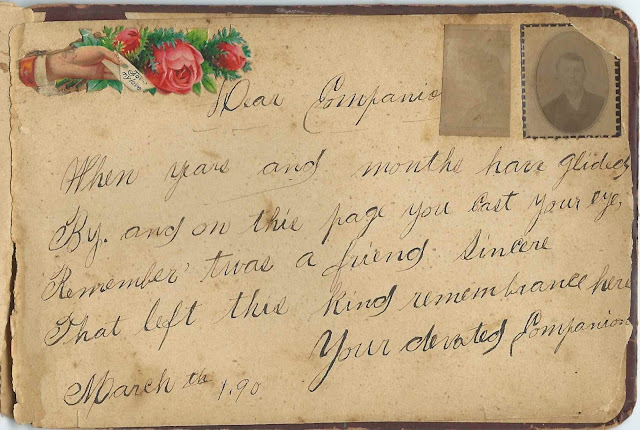 Page inscribed "Dear Aunt Necy"
"Your devoted companion", inscribed on March 1, 1890. Gem sized photographs of a woman and a man pasted on the page. 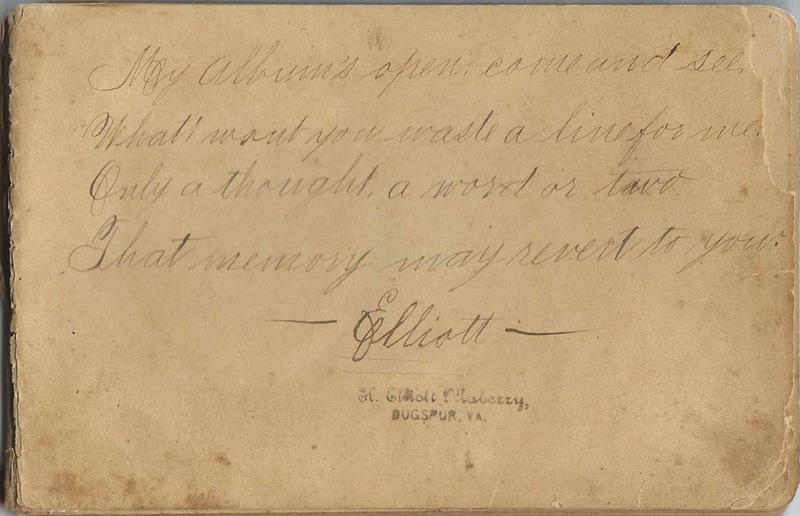 Could the page have been inscribed by Elliott's first wife Sue (Simpkins) Mabry, and the photographs that of herself and Elliott? Sarah V. Booker; she pasted her gem-sized photograph on the page. Harvey Elliott Maberry or Mabry of Dugspur, Virginia; album owner; he inscribed a dedication page. Delia Simpkins; a sad entry that might have been inscribed upon the death of Sue (Simpkins) Mabry? Sue Simpkins; inscribed at Snowville, Virginia, in October 1888. She would be become Elliott's wife in 1889; she died in 1904.